We're really excited to announce that our iPhone app is now available for download in the App Store! Nimble has reimagined CRM by building the first relationship manager that works for you, everywhere you work. Nimble takes the biggest pain out of CRM by building contact records automatically to help manage relationships wherever you work. Our customers love our #1 Rated Simple Smarter CRM combined with our Smart Contacts Browser App and now we’ve built a next generation mobile relationship app to deliver the contact and company insights you’ll need to be effective for every meeting. 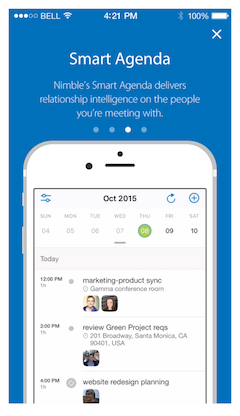 Our iOS app combines your phone’s contacts and calendars with our rich Nimble people and company insights. Sync your calendars to let Nimble build your daily agenda with insights on who you're meeting with. You can select any of your phone's calendars to display in our Nimble mobile app enriched with detailed contact and company insights for every engagement. Centered around your daily agenda: See all of your upcoming events in a clean list view. Quickly Create Events from the app home page. See All Your Phone calendars: At the current moment, events are read-only. Live Profile on Contacts: Nimble now displays the “Live Profile” of a contact record built for you from matched social profiles. See your task due dates alongside your events to efficiently plan out your day. Enable notifications to get the most relevant contact and company updates and insights on who you’re meeting with and reminders to leave follow-up notes after an event ends. You can customize this notification to appear 5, 10, 15, 30 minutes or 1-2 hours after your event is over. Sync your contacts so Nimble can deliver relevant insights on the people and companies you're engaging. Nimble syncs your phone contacts periodically or manually from the mobile app to your Nimble contact database. Periodic Sync - We sync your mobile contacts to Nimble whenever you launch the app from your phone. Manual Sync - Select the “Sync” option to add your contacts to Nimble. Apply a tag to this group or join them to an existing tagged group. “Last Sync” Date will appear after you perform your sync so you know when the last time occurred. This is one-directional sync from your Phone to Nimble. We will not populate your phonebook with any Nimble contacts. All contacts synced from the phone will be visible to your entire Nimble account. Create tasks for yourself or for your team that can be associated with any contact. See Upcoming, Completed, Starred, and Delegated Tasks. All tasks related to contacts are linked so you can jump from a task to a contact's details with one click. 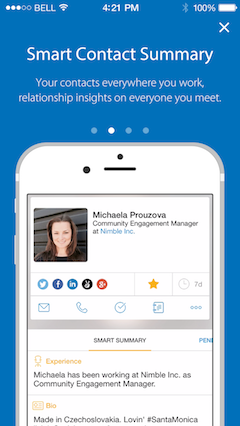 What features does the Nimble iPhone app have? Automatic Social Profile Matching to bring together relevant contact profiles, history, and insights together in one place. 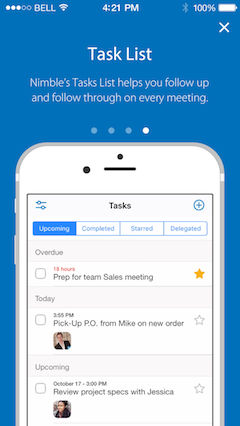 Nimble Smart Summary with detailed contact insights to better prepare for meetings and prioritize your day. Add, edit, and update Deals while you're on the go.